Is Water Really the Best Way to Stay Hydrated? Home » General Health » Is Water Really the Best Way to Stay Hydrated? For years you’ve been told to drink eight glasses of water a day and to avoid coffee, alcohol, and sugary drinks so as not to become dehydrated. And, of course we’ve all been told that water is the best way to stay hydrated. But an important new piece of research is challenging all of that. There’s really never been any hard data to support the idea of drinking eight glasses of water a day. Yes, there is a high percentage of water in your body, and yes, sugar, caffeine, and alcohol are diuretics (i.e. they increase your urine output)—but not in the moderate amounts found in beer, most coffee drinks, or soda. The British study, published in December 2015, established a “beverage hydration index” that works very much like the glycemic index. But instead of measuring how your body responds to sugar content, it measured how long various beverages keep you hydrated. Some fluids last longer in your body than others, leading to greater hydration. And for years the best hydrator was thought to be water, an idea that was actually disproven during this research! In the study, 72 participants drank 13 different beverages to test how long they remained hydrated. Fluid levels in the individuals were measured two hours after consumption. The faster a beverage was excreted via urine, the lower it ranked on the hydration index and vice versa. Water was used as the baseline and was given a value of 1.0. Lower than 1.0 meant that the beverage was less efficient than water as a hydrator, and more than 1.0 meant that the drink remained in the system longer. Can Beer Keep You Hydrated? Surprisingly, there were four drinks with a higher beverage hydration index than water. These were oral rehydration solutions such as “Pedialyte,” fat-free milk, whole milk, and orange juice. Orange juice came in at 1.1, while the other three were much higher at around 1.5. This is likely because of the electrolytes present in milk, which slows its expulsion from the kidneys. 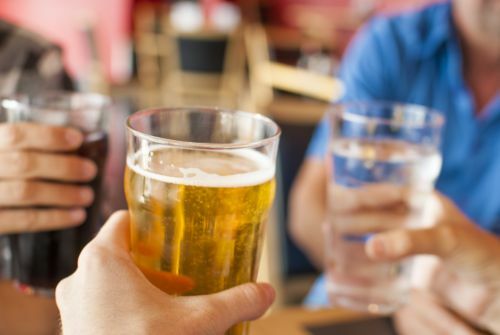 Soda, most coffee drinks, and beer had virtually identical index ratings to water. Strong coffee and strong alcohol (e.g., distilled spirits) were lower on the index. What makes this scale so valuable is that it can help you decide what to drink and when. For example, are you facing a long car ride with little access to bathrooms? A glass of fat-free milk might be your best option. And if you want a beer on a hot afternoon, it’s just as hydrating as a glass of water. It’s important to remember, however, that alcohol and sugary drinks are packed full of calories that water simply doesn’t have…and let’s not forget that regularly having more than one or two alcoholic drinks a day can cause liver problems, alcohol dependence, and other health issues. So in no way am I suggesting that you should swap beer or soda for water 100% of the time. I’m simply saying that if you’re worried about hydration because you’re drinking things other than water, don’t be—these beverages can also do the trick. Burfoot, A., “Milk and Other Surprising Ways to Stay Hydrated,” The New York Times web site, June 30, 2016; http://mobile.nytimes.com/blogs/well/2016/06/30/milk-and-other-surprising-ways-to-stay-hydrated/?smid=fb-nytimes&smtyp=cur&_r=0&referer=http://m.facebook.com, last accessed July 4, 2016. Maughan R., “A Randomized Trial to Assess the Potential of Different Beverages to Affect Hydration Status: Development of a Hydration Index,” American Journal of Clinical Nutrition; doi:10.3945/ajcn.115.114769.